It's the 21st Century, So Where's My Monorail to LAX? Getting people to the airport via train is a natural priority for cities around the country. When Minneapolis built its first light-rail line back in 2004 it had two major stops: the airport and downtown. But despite over two decades of modern Los Angeles embracing subways, there's still no train to LAX. And even if the city does build one, it probably won't look as cool as Goodell's sleek 1963 proposal above. Now, it may surprise people who don't live in Los Angeles that the city has a functioning mass transit train system to begin with. It does and it's actually pretty slick. But one of the biggest complaints about the system is that there's no train to the airport. Megan Gambino over at Smithsonian magazine took a look at some of the Los Angeles futures that never were, including the Goodell monorail design that would've run from downtown to LAX. It's just one in a series of many failed transportation futures dotting L.A.'s historical landscape, but for those of us who live in this upside down city, it's the one that probably stings the most. 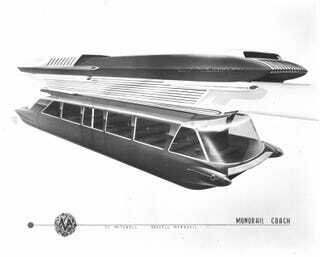 In the early 1960s, Goodell Monorail Systems proposed a monorail from downtown Los Angeles to LAX. The $40 million project would take 18 months to complete—a much speedier build than an underground system. And the cars, which resembled Cadillacs, could travel the 17-mile line at 90 miles per hour, making the travel time to the airport less than 20 minutes. It was a promising option, particularly for Los Angeles, which was trying to catch up to other cities in regards to public transportation. "But, again, people didn't want things above their head," says Lubell. There's still plenty of discussion happening about the best way to expand LA Metro's rail lines to LAX. But locals aren't exactly holding their breath. We've heard this one before. With the city's Expo line expanding to Santa Monica in the next few years, abandoning the automobile is indeed becoming a more attractive option for smog-choked Angelenos. But until those trains run all the way to the airport, L.A.'s mass transit system will (fairly or unfairly) still be a punchline.